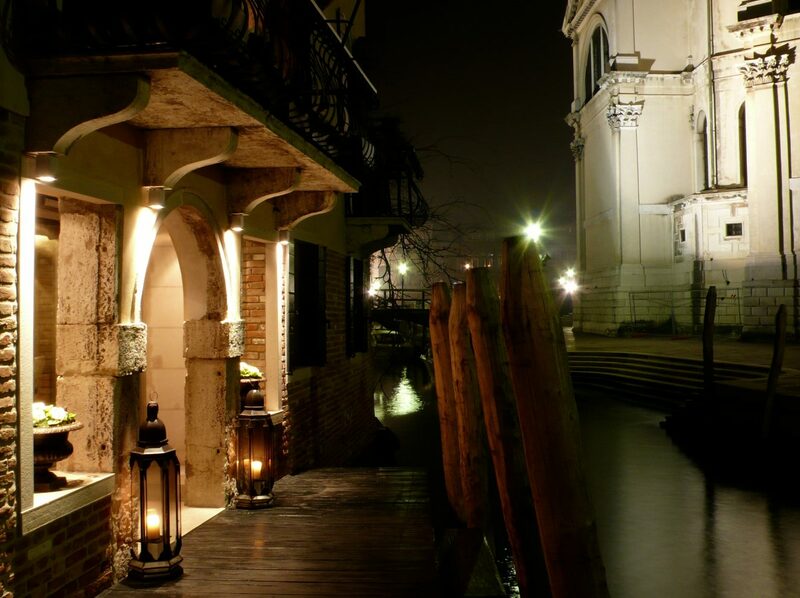 Ca Maria Adele – perfect, bijou hotel in Venice. With all this recent brouhaha from debating the banning of day-trippers from Venice, I thought it time to put together some posts on that rather wonderful city. I have to admit that I am a lucky so-and-so to have stayed in such amazing places over the years, and for me, one of the most memorable was Ca Maria Adele in Venezia. There is nothing like staying in the city, roaming the streets at night when all the day-trippers have left. Magic. My first time in Venice, we took a Riva directly to the hotel. We’d stashed the car at the railway station after an horrendous drive through the industrial wasteland between Verona and Venice, and I was seriously doubting whether Venice was going to live up to it’s promise. 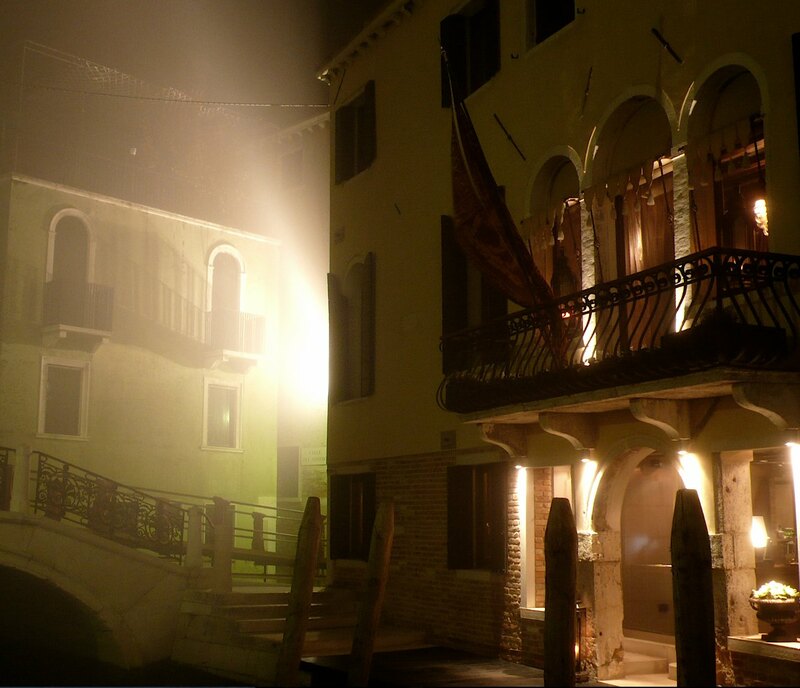 But when we got in that taxi and made our way through the foggy, almost deserted canals I was utterly blown away. Venice, in winter, in the fog is an astonishing place, and to pull up outside this little palazzo with it’s front door flanked by huge hurricane lamps, with no other life around and just the hulking presence of the basilica – thrills me just thinking about it again. Ca Maria Adele is perfectly positioned (opposite the basillica of Santa Maria della Salute), right at the far tip of Dorsoduro, which is arguably the prettiest and most non-touristy part of the city. It is perfectly proportioned, having only 12 rooms. And your hosts are perfectly delightful too. Very helpful, very accommodating. I challenge anyone to try and find a more romantic bolt-hole in Venice. Rooms: 12. 2 suites. We stayed in suite 339 which has a little roof terrace, and is all gold brocade and exposed oak beams. If you don’t need the outdoor space then there are some gorgeous themed rooms with huge Murano chandeliers, red velvet walls etc definitely worth a look on the website. Dining: There is a beautiful breakfast room on the 1st floor with windows that open out onto the church and canal, as well as a Moroccan inspired terrace round the back, where you can sit and sup. There is no lunch or dinner served at the hotel. The breakfast room, terrace and lounge are for tea and cocktails (and breakfast…). Service: Impeccable service. It can take them a little while to get to you as there are lots of twisty-twiny stairs to climb to get to certain rooms. The concierge was very good and the GM Nicola Campa is often at reception and he is just the bees knees when it comes to hospitality. Facilities: This isn’t a place crammed with facilities, it’s a tiny palazzo. It’s more like going to stay in someone’s incredibly beautiful home. No swimming pools, no gyms etc. It’s just utterly private and gorgeous. Access: If you have mobility problems then this hotel isn’t for you as there are no lifts, and you can only get there by boat. Price: Now, I have only ever been to Venice in winter, and frankly would never go at any other time. We stayed in a suite for about €400 per night in Feb over Carnival. This was a lot cheaper than high season, and an utter bargain as far as we were concerned. Our concierge service at Coutts World found this hotel and sorted the price, and is probably still one of their most impressive finds/deals for us. If you are looking for somewhere awesome to stay and love small, high-end hotels, then this is an absolute must. It’s tucked away in a lovely, quiet part of Venice but within spitting distance of many of the major attractions.